Help your T-Bolts make their baseball dreams come true! Our players are NCAA-eligible college students who come from around the United States to play in the Cal Ripken League. With approximately 20 players coming from out-of-state each season, we rely on people in our community to help house Thunderbolts players every summer. If you love baseball and have room in your home, please consider hosting one of our college players. If you have children who love baseball, why not give them the unforgettable gift of bringing a real, live, college baseball player into your home? The generosity of our host families is what makes T-Bolts baseball possible. Consider joining our T-Bolts family by becoming a host family today! 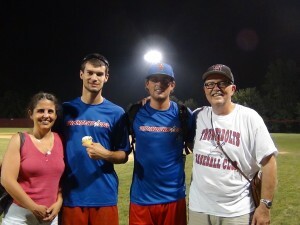 Host families often tell us that the players they host become like family to them. Host families receive a family pass to all T-Bolts home games, which allows all family members to attend our games and cheer on their favorite player for free!